Ventilating horses with a mixture of helium and oxygen improves outcomes in surgery, American researchers have found. A horse in general surgery is an awkward sight. For the best access, they may be placed on their side or even their back, a position that puts considerable pressure on their internal organs, often leading to partial lung collapse. Despite the use of oxygen-rich ventilation, blood oxygen levels can fall to dangerous levels during long procedures. Veterinarians have used several strategies to reduce these respiratory challenges, including using oxygen delivered under high pressure to ensure the alveoli — the small sacs in the lungs where gas exchange takes place — are opened up. Others have used a combination of helium and oxygen, known as heliox, with mixed results. Researchers at the University of Pennsylvania wanted to get more clarity on the best approach for ventilating horses. A study led by Klaus Hopster, assistant professor of large animal anesthesiology at the New Bolton Center, part of the University of Pennsylvania’s School of Veterinary Medicine, found that horses receiving heliox while under anesthesia did better than those receiving pure oxygen. Adjusting the pressure of the ventilation the horses received also improved overall oxygenation, the study found. “Our paper showed that when you use high pressure ventilation using heliox, you’re able to achieve better results,” Hopster says. Colic surgery is a common reason that horses may be put under general anesthesia on their back in order to easily access the abdomen. In this position, using gas under higher pressure to ventilate a patient can succeed in getting oxygen to the lungs’ alveoli, and overcome the heavy weight that makes lungs prone to collapse. But high pressures also put stress on the heart and blood vessels, in extreme cases leading to damage. 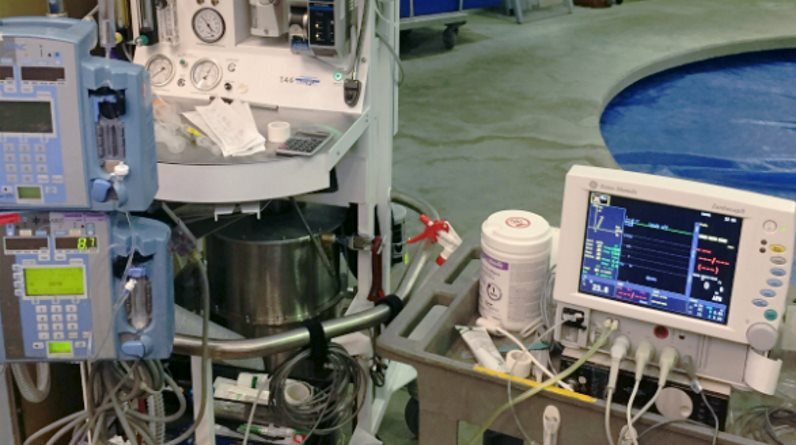 In colic procedures, which can be lengthy, prior research by Hopster and his colleagues has shown that ensuring sufficient respiratory function while a patient is under anesthesia improves outcomes afterward, likely because the volatile anesthetic drugs must be exhaled. Earlier studies by other researchers suggested that incorporating helium could be a way of striking this balance in humans. Helium is less dense than oxygen, making it easier to flow through small vessels and reach the alveoli, improving ventilation and gas exchange. To see if the same benefits were present in horses, the researchers examined several measures of good lung function and oxygenation in horses under anesthesia that were given either heliox or pure oxygen. Six horses owned by the veterinary school were used for the study. To ensure that the lung’s alveoli remained open while the horses were on their back, they performed what is known as an alveoli recruitment maneuver; in essence, slowly stepping up ventilation pressure, keeping the volume of gas constant. Hopster and his colleagues saw that horses ventilated with heliox rated better for two measures of respiratory mechanical function — low peak inspiratory pressure and higher lung compliance — compared to those breathing pure oxygen. In future work, Hopster and his colleagues would like to examine whether a mixture of oxygen and nitrogen might also be effective for horses, or whether this result is particular to the heliox mixture. They would also like to extend their studies to sheep, whose respiratory systems provide a good model for humans. That could help shed light on good strategies to ventilate people who already have compromised respiratory systems, such as individuals with asthma. Hopster collaborated in the study, reported in the American Journal of Veterinary Research, with the veterinary school’s Lauren Duffee, Charlotte Hopster-Iversen and Bernd Driessen. The research was supported by the veterinary school’s Department of Clinical Studies at the New Bolton Center.